The numbers on the arms are supposed to look like strapped-on weapons (like this), and that’s all I have to say about this often-requested design. The Thomas Jane Punisher film is one of my all-time guilty pleasures. It’s fun and bloody and doesn’t take itself too seriously (despite all the displays of brooding). Wish there were more films like it. 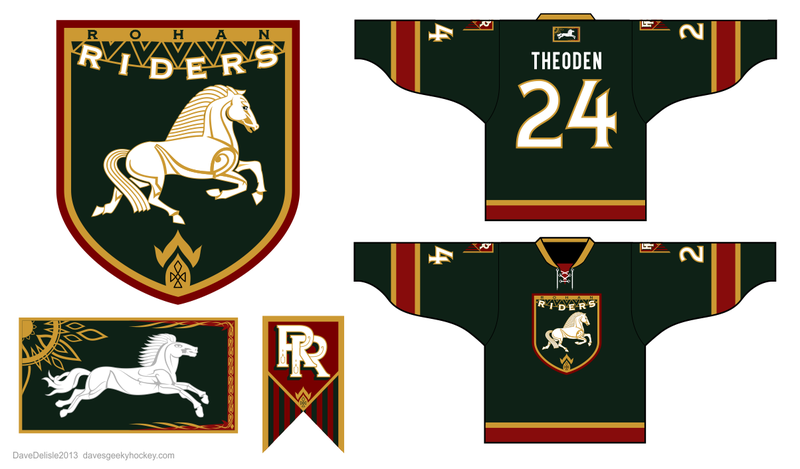 My first Lord of the Rings hockey jersey design! Truth be told this was actually commissioned by Jeff B. for his son Joseph, a die-hard LOTR fan and ice hockey player. I’m very happy to deliver this design for both of them. Thanks for letting me share the design here, guys! All the imagery is from the original films (The Two Towers, mostly). The front and shoulder crests take cues from flags seen in the Rohan throne room. The back neck patch is the actual flag of Rohan, the one seen falling to the ground in the film (just prior to Aragorn and Gandalf’s arrival in Rohan). The ‘RR’ was my own touch (otherwise it would’ve been another horse), inspired by the Rolls Royce logo. I had a bunch of different designs here for Autobots, but I narrowed it down to my top 3. Other designs were too similar (Smokescreen = Jazz, Mirage = Wheeljack), the Hound design looked a lot like the Flying Hellfish. If you like these be sure to check out Dinobots, Soundwave, and the Transformers Hockey League! This whole blog could be nothing but Transformers but I gotta draw the line somewhere.